Marks Dimensions 16 in. x 10 1/2 in. x 4 in. Hasbro went out of its way on this one--but not in the good way. The Arctic Blast uses cylindrical CPS technology: a thing we've desired to return; yet it performs no better than before. For a pistol, it's excellent; for a main blaster, lacking. Boasting a full 1.2L of water capacity, it shoots 35 decent feet. Upon further inspection, Hasbro appears to have designed the gun to perform poorly: the bladder can barely expand an inch in length and radius. 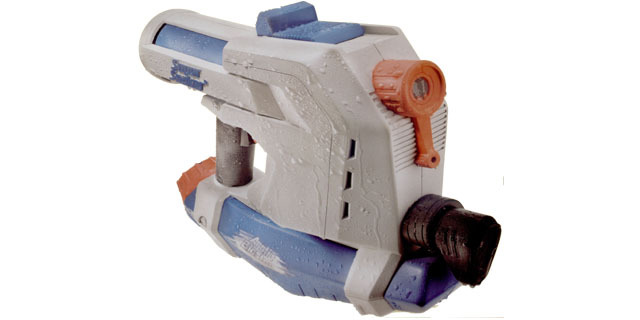 The flood nozzle is about 10x, performing poorly for a riot blast. The pump handle has to be a joke: it can't be gripped in the standard horizontal manner. But Hasbro finally got the "Quick-Fill Cap" to work though--this gun sports a visible check valve in the cap; yet the cap lacks the stopper device common in many previous guns. In all, the Arctic Blast is a step in the right direction.